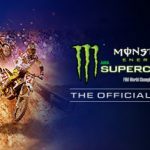 Last year I found myself pleasantly surprised with Monster Energy Supercross, a new racing IP from developer Milestone. Racing in stadiums across the United States, I was hooked on big jumps and muddy wipeouts. When the sequel was announced last year, I couldn’t help but wonder how they would improve upon the previous game. I’ve spent some time with Monster Energy Supercross 2, and while it’s just as fun as ever, it is a sequel that plays things a bit too safe. The biggest difference this go-around is the fact that I’m reviewing Monster Energy Supercross 2 on an Xbox One X, as opposed to last year when I played the original on a launch Xbox One. The previous game was plagued with slowdown when too many racers appeared on screen and oddly at every race conclusion. Thankfully, whether it’s the power of the X or improvements to the game engine, I never noticed much slowdown whatsoever. While this is a huge improvement to my biggest complaints of the last game, its hard to sing too many praises for fixing a problem that shouldn’t exist in the first place. Bright lights, big air and racing immortality await! If you played the original Monster Energy Supercross, you are getting nearly the exact same package with Supercross 2. From a created player career mode, to championship mode with real life riders, track customization and online play. It literally feels like the exact same experience but with more polish. Whether or not that is a good thing depends on your experience in the series and your love of the genre. Personally, I love the racing action and it’s a great game to play mindlessly while relaxing or doing other things. 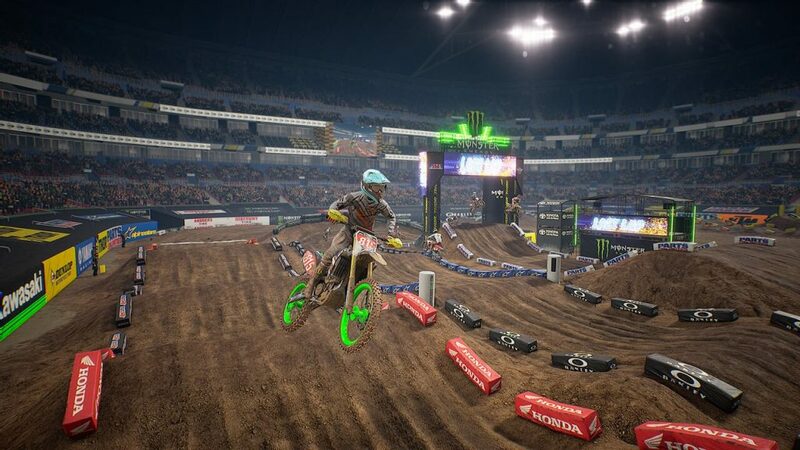 Monster Energy Supercross 2 – Milestone has gone above and beyond to bring realism and accessibility to the gameplay experience. Thanks to the new Advanced Inertial Response and Real Terrain Collision technologies, bike control is now more accurate and realistic, both on track and in the aerial phase. Moreover, the new Dynamic Flow Aid helps player to always find the ideal trajectory to jump and land. Rivalry races during career mode take place at the compound. The dynamic flow aid does paint a better picture for how you should land, but it hardly feels like a selling point for a sequel. All the other technical jargon sounds great, but to me these additions are sound more revolutionary than they actually are. Career mode has seen the biggest changes from the first game. Players must now create their weekly schedule to include events besides the race. What does that mean exactly? Well, you’re presented with a calendar for each week in a season and you must schedule activities on your free days. You can dedicate the day to promoting your sponsor to earn some quick money, you can also attend meet and greets with fans or the media to increase your fame. You can attempt challenges or choose to race a rival in a head-to-head event. Overall, these are nice ideas to flesh out career mode and give it more variety. There are 3 types of career modes: 250 East/West, which take place in stadiums in their respective areas of the country; Along with 450 which includes all locations. 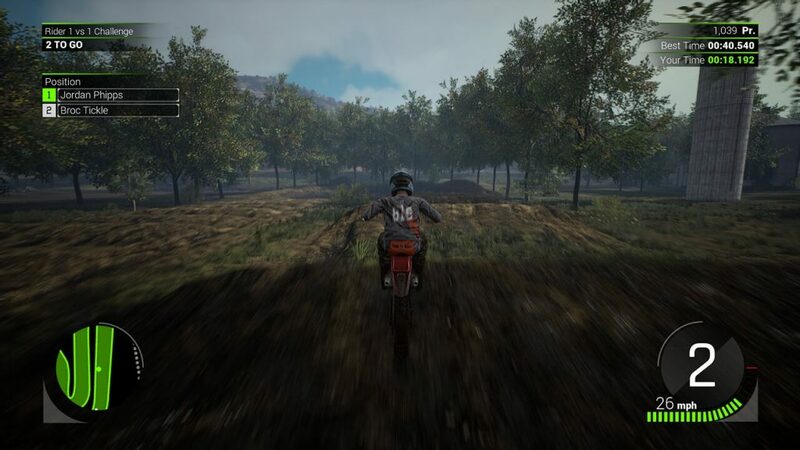 Like the previous game, there are plenty of options to customize your riding experience to your preference. This includes AI difficulty, weather, physics, transmission, race length and more. Customizing your ride brings along hundreds more options from real life manufacturer components, graphics and colors. As I said a year ago, Monster Energy Supercross series does not skimp on licenses with the bikes and locations; it genuinely enhances the experience. Graphically, anyone can see just how detailed and lifelike the racers and locations are. There is a photo mode included that I used to capture some screenshots in this review. One particular moment that made me say “wow” was racing in the rain and seeing the effect of water on the screen in combination with the flying mud, it was quite memorable. Rounding out the package are the track editor and online modes. Creating your own tracks and uploading them performs like the previous game and has a good amount of options to get your creative juices flowing. Like the online mode, your mileage will vary with the track editor depending on whether its your forte. 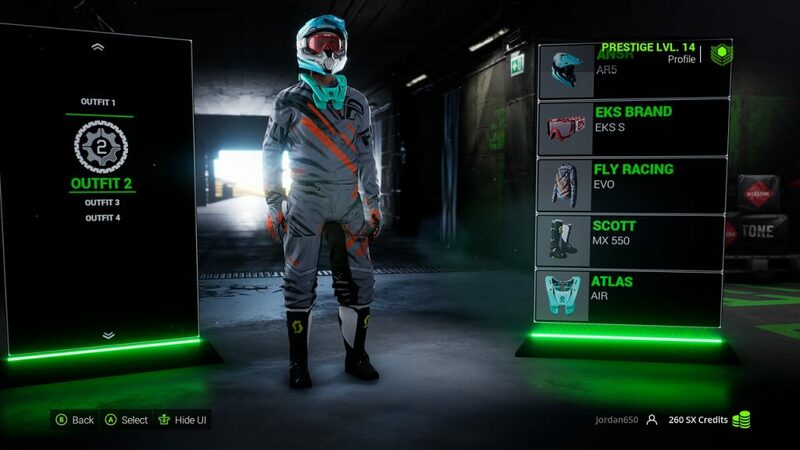 Lastly there is some day 1 DLC included in the Special Edition of three varieties: Outfit Starting Pack (two outfits), The Camo Pack (10 camouflage themed liveries and special suits), and a 2X Credits Multiplier that helps you level up faster. These will likely be available for purchase separately at launch. Four outfit loadouts allow you to quickly swap clothes after being purchased and assigned. Despite fixing the framerate issues and adding some extra content to career mode, I can’t bring myself to score Monster Energy Supercross 2 higher than the first. Is it a fun racing experience? Absolutely. Are there a bevvy of options to choose from? Yes! Maybe I set my expectations a bit too high or wished that there would be something new and exciting to set Monster Energy 2 apart. 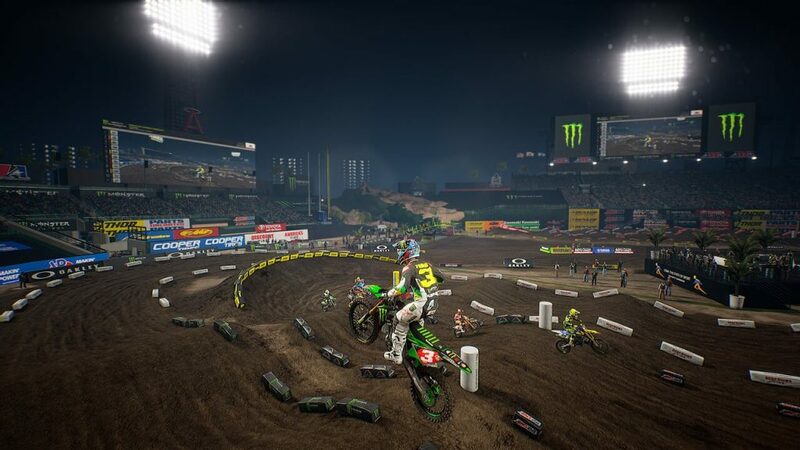 Nevertheless, it is still the definitive supercross racing experience on consoles. Anyone still helmets-deep into Monster Supercross 1 might feel content holding off on a day one purchase, everyone else should have no hesitations stepping into the arena.